After the refresh of Google Finance, I am in need of a Google Finance Alternative. The update is really a disappointment from a DIY investor perspective. Losing the portfolio was not a big deal but the new layout, new graphing and removal of some key data is a major let down. Google Finance was set as my homepage and the first thing I looked at in the morning with a coffee, now I am in need of a replacement that can provide me the necessary information to get a quick glance at the market, news and easy to read graphs. I was surprised to see how many tools were used outside of what discount brokers provide. In fact, not many DIY investors use their discount broker exclusively to look at data. 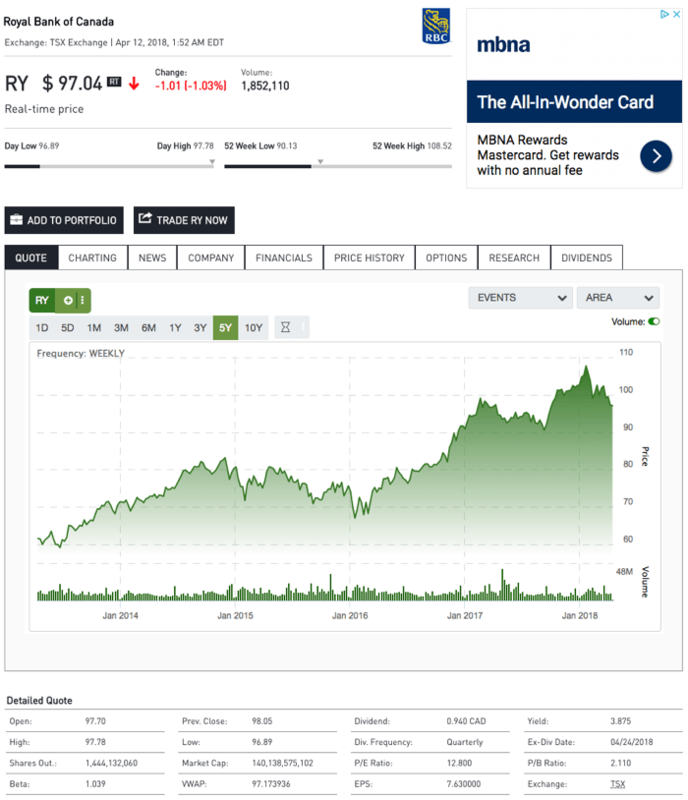 In the search for a Google Finance replacement for my quick market and portfolio overview during my morning coffee, I decided to test drive some of the sites I was suggested. I reviewed a number of stock charting & news tools used by many readers and decided to rate them according to the following set of criteria. Below is the list of tools that will be reviewed. 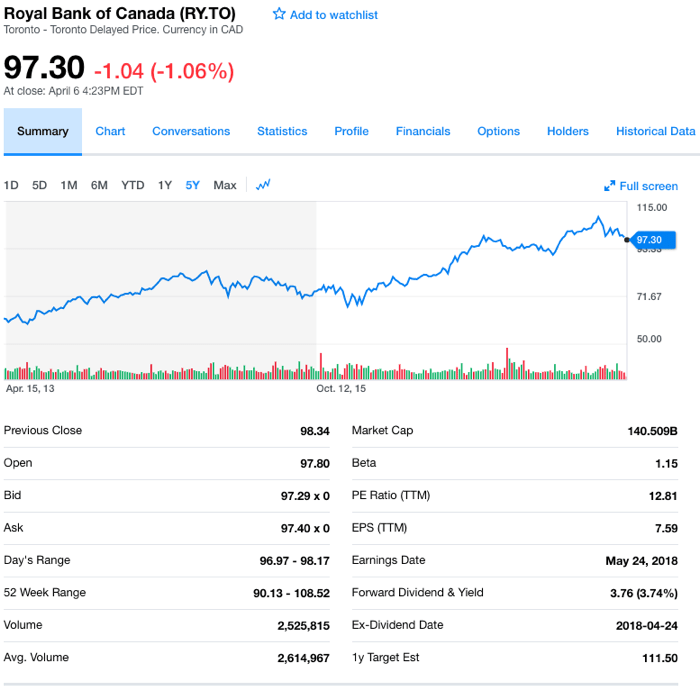 I created an account and looked up Royal Bank of Canada TSE:RYNYSE:RY and created a watchlist or portfolio where possible to understand the process and information on hand. I did receive a few more options when I polled my readers and at first glance, the tools either required an account or were not providing a portfolio style portal and decided against evaluating them. Quote Is the basic and fundamental stock information such as 52-week ratio, market capitalization, and dividend yield to name a few. News Does it provide news at a glance regarding the stock or list of stocks? Charting Can I compare multiple stocks within the same chart? Can I have arbitrary timelines? Portfolio Any portfolio tracking capabilities? or a simple watchlist. A bonus is to have the ability to group a set of stocks together. Mobile This is a bonus really but a consideration nowadays. Cost Is it free? Is the free version enough? My goal, before anyone gets upset at my ranking, was to find a replacement to Google Finance where I could quickly see what’s up with the market and the stocks in my portfolio. I had the stock I held in a list and could see the news pertaining to the list and I could see a clear up or down trend. I did not have to navigate away from the main page or select multiple tabs. I had it all set up in one page and it was clean and I searched for a similar setup. As you read through, feel free to adjust the ranking based on what you are looking for. Those are my rankings according to my needs but it should give you a headstart in finding what works for you. The ratings below have the following meaning. Yup, Microsoft did one-up Google in this category. In fact, it feels like Google just dropped the ball relying on the machines rather than human feedback for their design update. MSN Money is my best Google Finance Alternative. Quote – There is a lot of data available under different tabs but the basic price, range, market cap., dividend yield, beta, and PE are present. Those are pretty much the only numbers I could keep in my head (or at least the range) for a variance. News – I really like the layout of the news list. You can see plenty with a quick glance and you can see the source of the news as well. Considering MSN has access to Bing for searching content, the money news are as broad as what you would find on Google. When looking up a stock, I can see 18 news articles at one on a laptop compared with 5 from Yahoo Finance. Charting – The designer behind the chart has an excellent color palette. It’s really pleasing to the eye. The color is not relevant at all in the trend but looking at an appealing esthetic compared to a pixelated graph does impact the experience. With that said, there are 3 visual graphs and 6 fixed timeline. The timeline is where I would have like some customization to chose the time window. For a quick snapshot during my morning coffee, all is good. The comparative capabilities are also well done and represented. Usability – It had been a long time since I had looked at MSN Money and I was pleasantly surprised at the ease of use of the website. It did not take me long to figure out the UI. Entering a quote took a bit of searching at first, but once I found it, it was easy. I particularly like the attention to details like clicking on a stock in the portfolio list opens a new window automatically. Portfolio – With an account you can track your portfolio and have multiple account representations. You can even track transactions if you are so inclined. I already religiously track my portfolio, I don’t need to replicate the transactions elsewhere. Mobile – The mobile version is cleaner than the desktop but with less screen space as you can imagine. Cost – It’s free and you can use any email to track your watchlist and portfolio. Yahoo Finance was the first candidate I thought of when I realized Google Finance wasn’t meeting my needs anymore. However, for some reason, Yahoo Finance has never appealed to me or provided me with the experience that I was seeking. I think the site is too overwhelming for me from an interface perspective. Quote – All the necessary data to get a snapshot are present and easy to read. 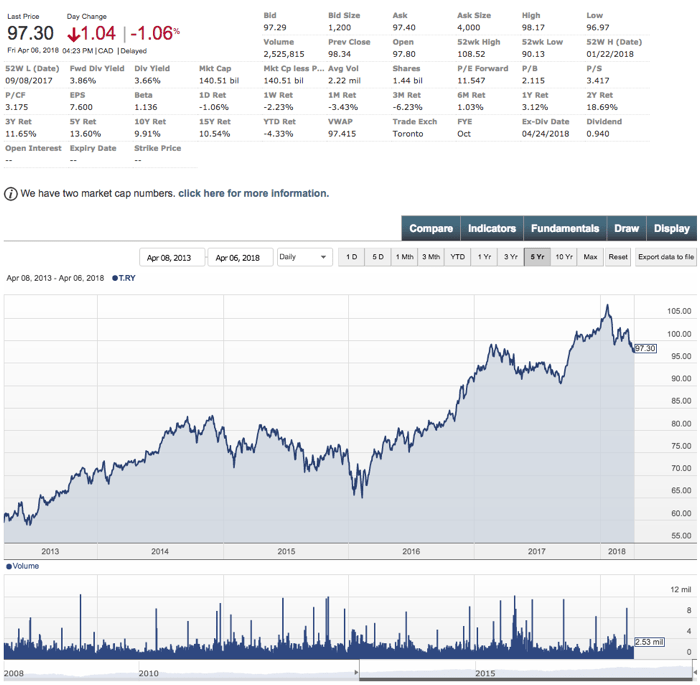 News – While I prefer the layout and number of news from MSN, the Press Release option from Yahoo finance is a nice one. Unfortunately, Yahoo’s news is older than MSN. 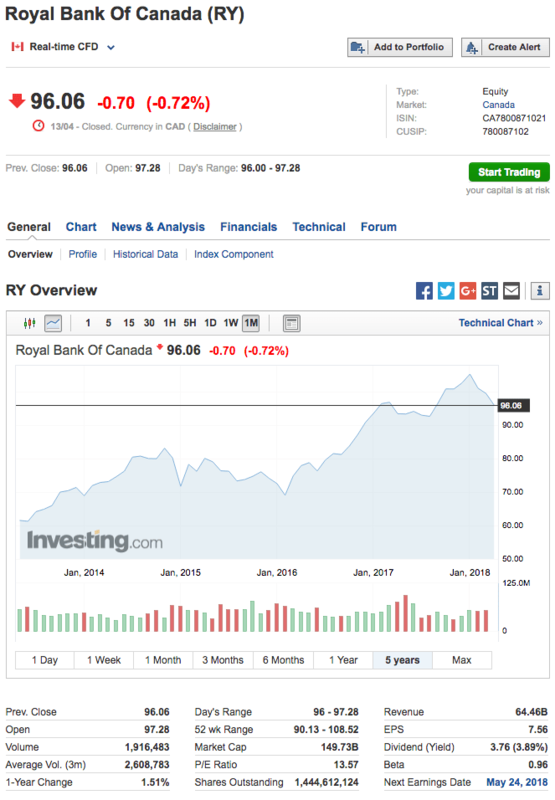 When comparing what is shown for Royal Bank, the news on Yahoo are days old whereas MSN has hourly updates. Charting – The graph is well done and satisfy my needs to compare multiple stocks. Usability – I won’t repeat my introduction statement. The fact is, the interface is overwhelming and there is a lot of advertisement in your face. Portfolio – There is both a watchlist and portfolio. The tracking is well done and the visual range is easy to read. It’s pretty standard otherwise, you get to have a current value of your holding as per the number of shares you own if you are inclined to update it. Mobile – It’s well done and has been my go-to app on my phone until I found MSN Money. Cost – Free. Just create an account and you are all set to keep track of your portfolio. The mobile version doesn’t need an account to track a watch list. Investing.com has a wealth of information to offer. You have to get past the initial experience an overwhelming amount of data with fonts smaller than most. It compares to Yahoo Finance in terms of the initial experience and is a good Google Finance alternative. Quote – All the basic information on a stock or portfolio is provided to have the basic data points on hand. News – The news headline section breaks down the different source of information allowing investors to filter by sources if desired. The layout of MSN Money is still better for a bird’s eye view and scanning the page but it has more sources than the standard aggregators with a nice filtering touch. Charting – The charts may look familiar as it’s powered by Trading View so it’s powerful and could be intimidating. Usability – It’s comprehensive and logically set up but also overwhelming. The ads put me off. On a large screen, the ads still take 30% of the space and it probably drives the fonts smaller to fit more and it leads to a negative experience as the fonts on the ads usually take over your attention. It’s the same issue I have with Yahoo Finance. Portfolio – The portfolio or watchlist is easy to use and effective. The only issue is that you have to switch tab to see news and you lose the listing of the stocks. There is room at the bottom to show the news. Again, I feel MSN Money got this interface figured out. Mobile – The mobile app is one of the best so far. Between Yahoo Finance, MSN Money and Investing.com, you have a solid mobile tool. If mobile is important to you, you should consider Investing.com. There is a big difference between the Canadian and US versions of Morningstar. The Canadian version is on an old design whereby the US version is on a new refreshed design. The new design is more appealing and simpler to navigate. Morningstar shines against the competitors by showing extra information such as the competitors and more detailed financials. Quote – The fundamentals are easily accessible and easy to read with more financials at your fingertips if you scroll down. News – The news data is pretty exclusive to official financial news aggregators such as NewsWire, or PR Newswire. For a few US stocks, no news showed up … a little disappointing. Not the quality of news I am looking for. Charting – While finding a stock to pull up was not intuitive, the chart comparison is just the opposite. 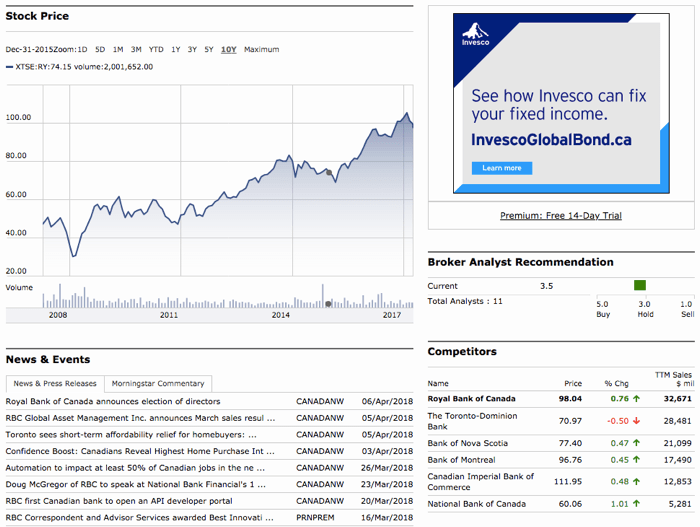 I pulled up the comparison for Royal Bank of Canada TSE:RY and the competitors all showed up as options. I tested it with Enbridge TSE:ENB and the same happened with 6 pipeline competitors. Usability – As mentioned in the intro, the US design is easier to navigate but that’s not to say the Canadian design is not. The Canadian design has tabs to navigate between the data set and the page is well organized with separators to group the data together. Portfolio – The portfolio management is not easy to use. The interface is definitely not keeping up with Web 2.0. It works but there are more steps needed than necessary. Mobile – No mobile app found. Cost – The free plan compares to all the other providers but you are reminded through the site about the premium subscription to unlock added features. My first experience was a disappointment as a Canadian looking to pull up Royal Bank of Canada. The ticker format is not intuitive and it creates a frustrating experience to find the stock you want. If you are familiar with MorningStar, you will notice similarities in the data and feeds since it’s powered by Morningstar. Quote – It has excellent data. Possibly too much for the untrained investor. I really like how the sector and industry are up front. I believe it’s a very important data point when investing to understand the actual business. News – It’s the same disappointment as Morningstar. Sorry, but I want to see more news outside of what the companies have to say. Charting – It’s exactly the same as Morningstar. The colors are different but the same overall. Usability – Aside from the inconsistencies around the ticker name, the usability is consistent with web 1.0 design. It does not resize or adjust the layout based on the window size and has many menus to navigate. Portfolio – There is support for both a watchlist and portfolio tracking. The portfolio has a nice feature where you can compare it to an index and it also tracks dividend. I have my doubt that the dividend works properly since it’s usually manually tracked but if you wanted to track your portfolio with dividend growth and performance tracking against an index, you can try it. 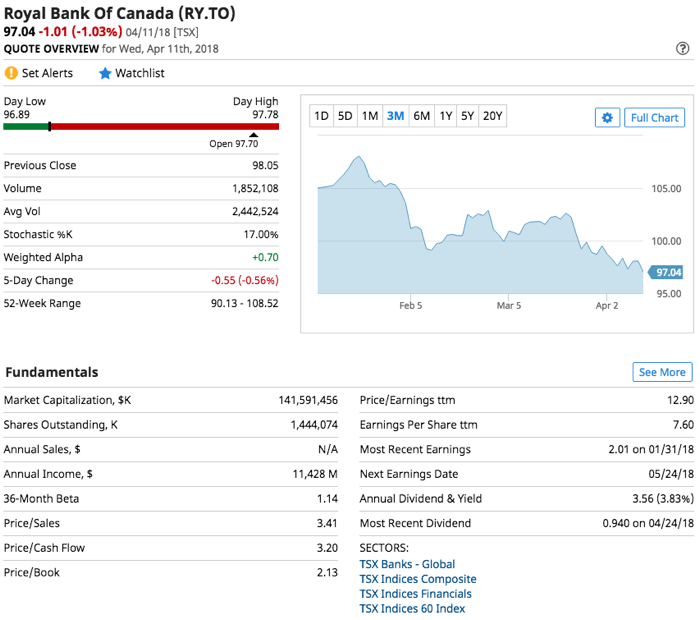 TMX Money is the DIY investor service out of the company that runs the Toronto Stock Exchange. I did not find it good enough for my needs in the past but if you are a Canadian investor with a Canadian portfolio, it may work well for you. Quote – All the basic data points are present and easy to view. News – News provided are from the standard financial news aggregator. No search engine news surfaced. Charting – You can compare to indexes and stocks which is a minimum requirement for me and you get the picture but the interface and visual is stuck in time. Too many steps to refresh and update the chart. Usability – The interface is functional but can be clunky when compared with other Web 2.0 interfaces. Creating a portfolio is not as intuitive as other competitors. Portfolio – Portfolio management is present with too many steps to manage it and it’s tucked away on its own away from your overall account and no news shown against your portfolio. Mobile – No mobile app found although there exists a TMX Money Dividend app. Cost – Free with a paid option for real-time data. A pleasant option for looking up stock information but mostly geared towards technical traders. Quote – The standard data points are present with a neat price alert feature. It’s the easiest alert setup I have seen so far. 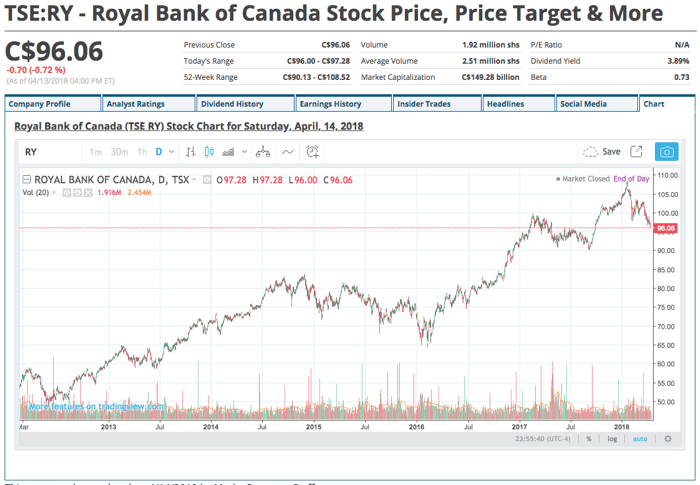 Charting – The visual is pretty consistent with the competition and good overall with many options but unfortunately, I could not see how to add other stocks to compare. That’s a feature I like to see to understand comparative growth over time. Usability – The site, menus, and charts are easy to use. Portfolio – Portfolio support is present but I found it confusing as the price for a transaction needed an entry and exit price. A little confusing with little explanation as to how the data was going to be used. A lot of data is available and some of it unique. I don’t find it particularly well laid out for what I am looking for but it’s possibly a good research tool if you are interested in analyst ratings or insider trading. Quote – A simple set of data points is present on the first tab. I find that most other options show the dividend and the yield to avoid having the investor hunt for it. Often times, it’s the annual dividend with the dividend yield in brackets. The missing P/E Ratio as seen in the image below doesn’t speak to a good data source or update from the system. All other competitors have the P/E displayed. 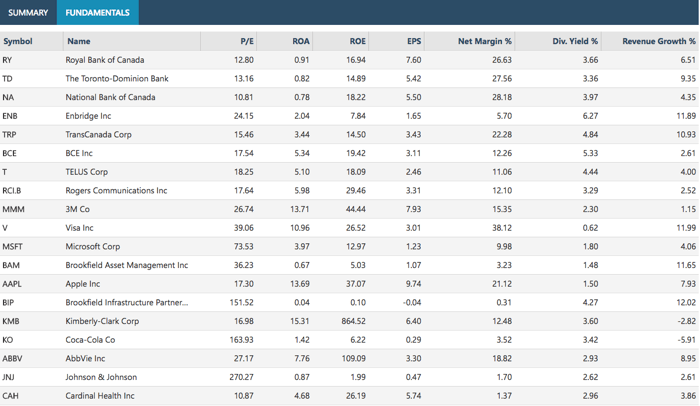 Again, a good representation is the P/E Ratio with EPS in brackets if you want to save space. Charting – Charting is provided by Trading View so it’s powerful. At this point, why not just use Trading View if that’s what you want. Usability – The layout and data presentation doesn’t work for me. The chart tab is at the end and not even included in the primary tab or view. Portfolio – No portfolio or watchlist support from my purview of the interface. While there are paid features, it seems to open access to research information and timely notifications. Mobile – An app is present. Trading View has a lot to offer but it falls short for me. It’s trying to be in the social or crowdsourcing of investing idea similar to Seeking Alpha and it promotes ideas over the news. On the flip side, you are not overwhelmed with advertisement and the UI is appealing and it comes with a mobile app. Quote – The cursory data view has limited information at your fingertips and the option available isn’t ‘fundamentals’ but ‘technicals’. That should be your clue here that Trading View is technical platform first. 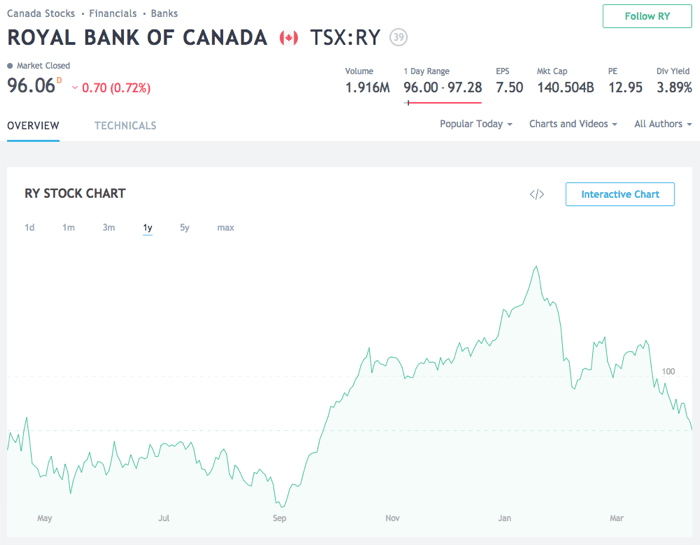 News – There is a news section tucked away and in the case of Royal Bank of Canada, it only pulled data from Yahoo Finance. All you know is that Yahoo Finance picked up the news and you don’t know the actual source. Charting – The chart is powerful. It’s one of the best in class. In fact, it’s so powerful, it can be scary to figure out how to use it. I would prefer fewer bells and whistle with a condensed menu for non-technical investors. Usability – Due to the technical investing approach, the terms used in menus and layouts of the menus are not easy to follow. It takes time to find what otherwise should be at your fingertips. The sidebar watchlist is what I would want as my primary interface. Portfolio – No portfolio, just a watchlist which is enough for me and it allows you to group them. Mobile – A mobile app exists and works well.